Doctor Who and the Krikkitmen by Douglas Adams. Doctor Who and the Krikkitmen by Douglas Adams Paperback Book Free Shipping! Doctor Who and the Krikkitmen, Adams, Goss 9781785941054 Fast Free Shipping.. 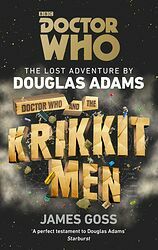 Doctor Who and the Krikkitmen by Douglas Adams Hardcover Book Free Shipping!